Our wedding date was October 8, 1933, the day that the Holy Name Parade was held in Newark. We were married at 4:00 p.m., and the ceremony went fine. Many people attended the wedding. After we came out of church, we headed for the photographers' studio to have pictures taken. It took almost two hours. Jule lived only a half a block from the church and the Priest's home, which was on 9th Street. 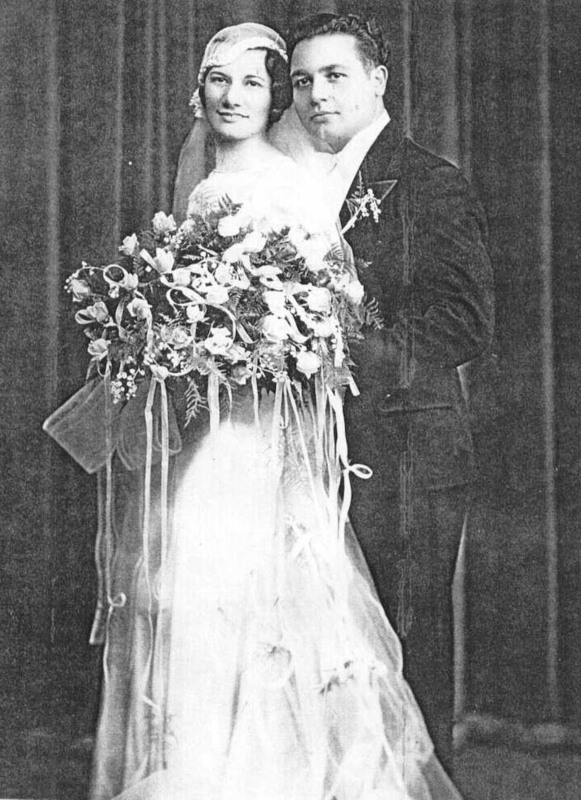 We were married by Father O'Leary, who often passed Jule's house while on his way to the Sisters' home, which was on 13th Avenue and 9th Street. My best man was my compadra who lived Down Neck near Wall Street close to the Hensler's brewery. His name was Pat Diacova. He had a sister, Antonitte, and a brother named John. We were friends and compadras from Down Neck. He and I use to go to the public baths and swimming pool located two blocks from his home. We learned to swim in that pool. After swimming, we would go to his house and his mom would feed us delicious fried chicken--and I mean it was good! Since we were young and hungry, we really enjoyed those afternoon meals. Our families often visited each other and had dinner together. Our maid of honor was Amelia Briscione, whom also lived Down Neck on Nickels Street near East Side High School. She worked in the same department with Jule at the Prudential Insurance Company. They became attached to one another and often took vacations together along with some of the other girls from the same office. They were more or less like a clique. Amealia was her best friend, and became our maid of honor. The rest of the bridal group consisted of Jim and Anne Mango, Ernest, a friend of ours from South Orange, and Lil Lutz who also worked at the Prudential Office. Ernest was an adopted son of an Italian family. He wasn't Italian himself, but he was very nice, and came from a very nice family. He was very reserved and polite. Then there was my cousin Mickey and my sister Rose, and Jimmy Pante and his wife Netti, but I don't recall if they were married at that time. After the wedding ceremony, we toured the neighborhood, blowing horns and yelling and doing everything we could to awaken the people to the fact of our marriage. Then we went to the Clinton Masonic Hall located on Clinton Avenue and Semour Avenue, for the wedding reception. When we arrived and entered the hall, we had the usual wedding march. This was followed by the bridal party's first dance, which included the parents of both the bride and groom. Afterward they were ushered to our reserved table, which included the complete bridal party. The hall had many round tables for families to sit at and enjoy the many types of sandwiches and beer, wine, soda and some liquors. There were no problems, which sometimes occur at weddings and dances. At 11 p.m., we decided to sneak away with only the immediate family being made aware of our plans. The band was paid to play until 12 o'clock midnight. We headed to our hotel, The Riviera, located at Clinton Avenue and High Street. We had a room reserved on the 9th floor. The next morning we headed for the bank and then for Niagara Falls. For the wedding, I wore a tuxedo and Jule worn a beautiful wedding gown. But on the trip the next morning I wore a business suit, and Jule had on a nice two-piece suit. 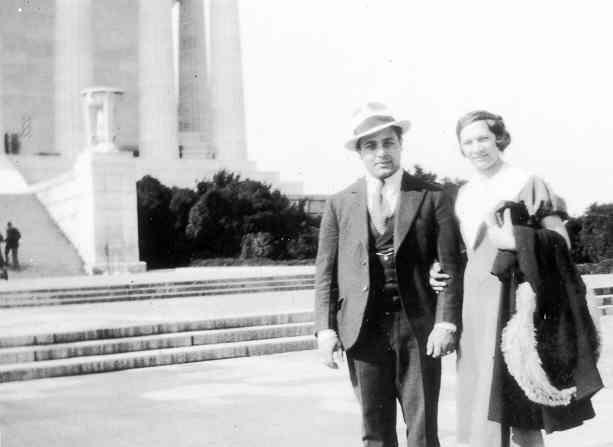 We left Newark on Monday, October 9, 1933, and drove to Buffalo and Niagara Falls to visit some friends. 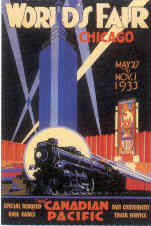 Then on to Chicago and the 1933 World's Fair. From there we drove to West Virginia, Virginia, and then to Washington, D.C.
We spent one week in Washington, DC touring all the sights. We had a beautiful room at the Burlington Hotel, and had lunch and dinner at some of the other hotels. It was at one of the famous bakeries in Washington that I fell in love with Pecan Honey Buns--mmmm delicious. I have favored them ever since. We only had one mechanical problem with the car on the trip, a cracked head that occurred in Indiana. We stopped for gas and I put some water into the radiator, which was low because of a water leak. Then--crack went the engine head. A small country garage installed a new one and off we went to Chicago. of the plant which explained all the various operations in the manufacture of tires. When we left, they escorted us to our car and bid us farewell. They politely remarked that our car was not equipped with Goodyear tires. I explained that I had just purchased the car and intended to replace the tires with the Goodyear brand just as soon as possible. Our honeymoon was a three-week vacation, a good trip, and then we went back to work. I had a friend take care of my business during my honeymoon. He did a good job. Now married, we rented an apartment at 415 - 15th Street. It was on the top floor, airy, and pleasant. We had a very strict Italian landlord. She was only five feet tall and weighed 120 pounds, but she ruled with an iron hand.